"Antarctica" is a frigid exploration of the romanticization of exploration. It will be enacted as a series of stylized actions by The Explorer, The Polar Bear, The Mermaid, and Cthulhu. Evaluating the boundaries of friendship and summer, "Antarctica" is a heart warming tale of finding one's voice at the bottom of the world. 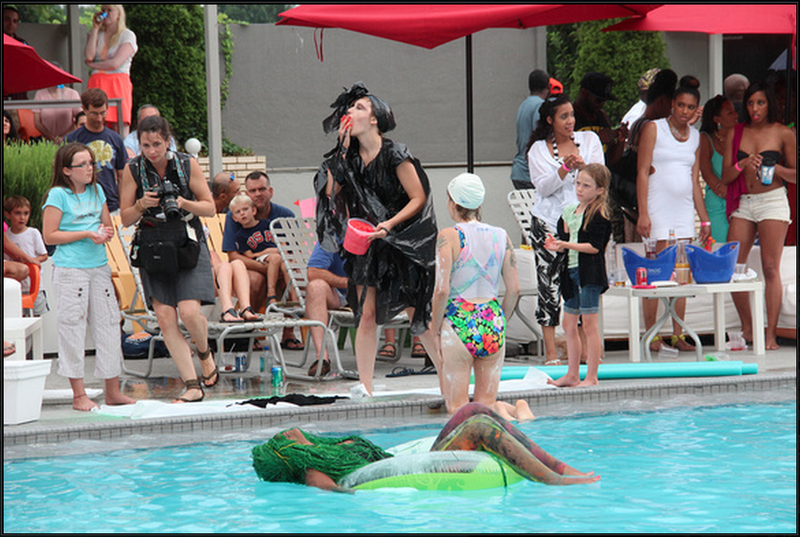 August 3, 2013 Performance for Washington Project for the Arts' SynchroSwim competition. We tied for first, but finally came in second by just one point. The track above is the soundtrack I made for the performance. 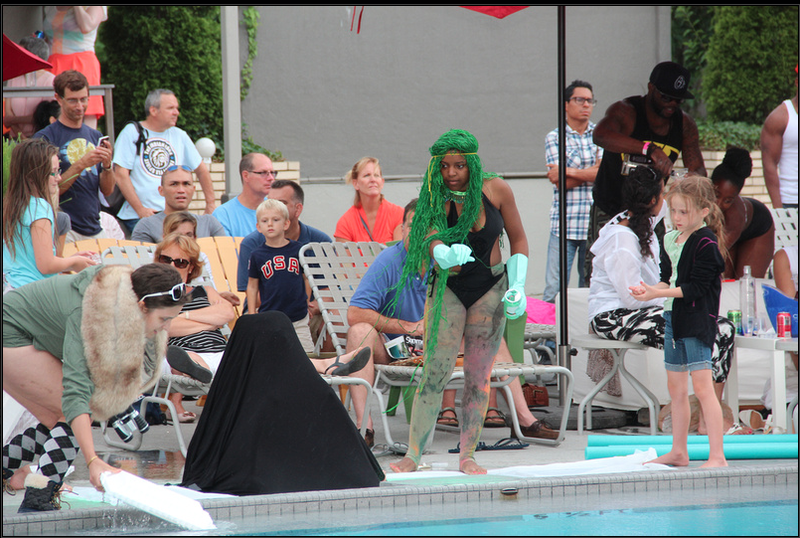 Washington Post Water ballet with a sense of humor at SynchroSwim 2013 in D.C.
"Coming in just a few points behind was “Antarctica,” a revisionist “Little Mermaid” staged by Aether Art Projects. Various food products were involved, including a bottle of Strawberry Nesquik employed by the explorer who triumphed over Ursula and her tentacles. It was amusing, to be sure. Unless you were the lifeguard, who at the contest’s end was left skimming Crisco out of the pool." To be clear, Lindsay was not Ursula, but Cthulhu. "Artist Eames Armstrong is used to getting props for her curation work and performances, but she doesn't get much attention for her swimming ability. She's terrible in the water, she says. Yet Armstrong, along with three other artists, has crafted a semi-improvised water play, Antarctica, that includes The Little Mermaid and the Lovecraft squid monster Cthulhu." Examiner Art in DC has to "SyncorSwim" "The local District of Columbia art scene may not be the art mecca of the world, but artist Eames Armstrong wants to show that the District has a style of it's own. At the Capitol Skyline Hotel, Armstrong, along with three other artists, has put together works of art that involve H2O. They've banned together to create a slightly-improvised play in a swimming pool. The play, entitled Antarctica, brings together characters like The Little Mermaid and the Cthulhu, the Lovecraft squid monster. Oh....and there's synchronized swimming. Some people don't view synchronized swimming as art, its a hybrid combination of swimming, dancing and gymnastics. So Armstrong isn't far off with bringing her play to the D.C. public."